The Tankwa Reserve has intrigued me since the time I inadvertently drove the R355. How, you ask do you “inadvertently” drive the longest road between two towns in the whole of South Africa. Easy, is the answer, you just turn left just outside of Calvinia, looking for a quick road home after looking at the Spring Flowers. Simple really. Problem is that there is this oil shale that litters the country thereabouts. From a distance it doesn’t look too bad. A bit black maybe, but not too bad. Its when you get closer that it gets to look a bit more threatening. And it gets awfully hot or awfully cold, depending on the time you happen to be there. That is Skoorsteenberg in the distance and to quote Mike Lodge (who made some informed comments – thanx Mike) “It is the place where all the oil companies have been investigating fracking.” This will not be a fracking site, but has been part of intensive exploration by the oil companies. This is picture of Pramberg in spring. Picture supplied by Mike Lodge and taken by Carl Gerber. 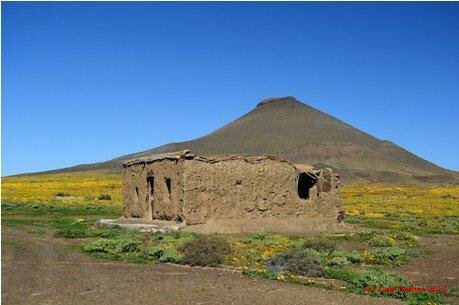 The spring flowers are, I am told superb and the picture gives some idea of the effect of the spring rains on this barren land. Having thoroughly dissuaded you from visiting, let me change tack and insist that you MUST see this reserve. If you love drylands and what the Americans call “Big Sky Country” this is the place for you. On the eastern edge of the reserve is the Gannaga Pass a beautiful, rugged Bains Pass and a must do if you are into mountain passes as I am. The seer-oog flowers bloom in April and wait for the Spring rains in September for water. Hoodia. Nice to look at, but kinda smelly. There are mammals in the Reserve and they are fairly easy to photograph. The roads aside from having sharp tyre cutting shale are good and well kept and the country is photogenic beyond belief. I even saw some humans. Actually that is Amanda and our guide and mentor Johan, a voluntary ranger who showed us the Reserve with patience, courtesy and friendliness. Here is Johan stalking Mountain Wheatears in the grass. And before you start wondering and worse still muttering, yes, I did play with the images. There has been some tampering. And to show my complete brazen cheek, a couple of art photos. There are farmhouses and labourers cottages spotted all over the reserve. We stayed at Paulshoek. Take a look in the SANParks website to get a better idea what the places are like. As with all SANParks accommodation, the place was clean, well stocked with equipment and comfortable. The next picture is not official accomodation, but it made a great hook for a landscape picture. But we were there for the birds. And here are some of the pics we got. Sparrows you will see aplenty. And art pic and a bird at once. And a moonrise to finish off.